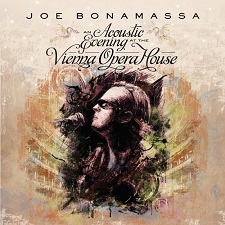 Review: "Bonamassa, Joe: An Acoustic Evening at the Vienna Opera House" - Sea of Tranquility - The Web Destination for Progressive Music! Some might say that superstar blues/rock guitar virtuoso Joe Bonamassa is approaching the point of overexposure these days, and in truth, he's probably not far from it. Along with the many solo studio & live albums he's released over the last few years, we've also seen him appearing with the hard rock supergroup Black Country Communion, duet releases with singer Beth Hart, the instrumental project Rock Candy Funk Party, as well as numerous guest appearances with artists such as Jon Lord, Europe, Derek Sherinian, Leslie West, Don Airey, Lee Ritenour, and many others. In other words, Bonamassa is out there; you just can't miss him these days, and there's a reason for that. The guy is a damn good guitar player who can fit into a few different styles, and he's also a very solid singer. This latest 2CD live set, recorded at the Vienna Opera House on July 3, 2012, is an all-acoustic evening that features Bonamassa on acoustic guitars & vocals, Gerry O'Connor on Irish banjo & fiddle, Mats Wester on nyckelharpa & mandola, Arlan Schierbaum on harmonium, accordion, baby piano, and glockenspiel, along with veteran percussionist Lenny Castro. Plenty of Joe's original favorites as well as a wide assortment of cover songs are played here, and instead of the normal fiery blues-rock style things are decidedly quieted down and sparse, which in many cases gives you a different side to some of these tunes. "Dust Bowl", "The Ballad of John Henry", "Around the Bend", "Dislocated Boy", "Driving Towards the Daylight", "Slow Train", and "Mountain Time" all take on a more deft touch, with Bonamassa's emotional picking and tender vocals front & center. Some of the highlight covers include John Martyn's fun "Jelly Roll", a forceful take on John Waits' "Jockey Full of Bourbon", a gut wrenching and quite bluesy "Stones in My Passway" from Robert Johnson, and a wonderful rendition of the Bad Company classic "Seagull", with Joe successfully paying tribute to Paul Rodgers' vocals. To top it all off, the band assembled here for this gig does a stellar job providing all the colors & textures needed to help turn these songs from their original electric beginnings to this charming acoustic setting. While this live set doesn't contain the scorching electric guitar extravaganzas we've normally come to expect from a Joe Bonamassa live set, there's a different side to his playing here that should appeal to any of his fans and especially those who appreciate acoustic blues & rock music. Produced & mixed by Kevin Shirley, An Acoustic Evening at the Vienna Opera House sounds warm and intimate, which was without a doubt the right way to go here. Well done.